This is why you need IT elements (and didn’t even know it). Say, for arguments sake, you are in the office/classroom/pub and someone mentions business modelling or data models. Asking Google about ‘models’ is not going to help you much! It seems an odd topic for an IT-related blog and for a middle-aged man to be discussing, but I do a lot of modelling. Read on and I will explain. One definition of a model is, ‘a three-dimensional representation of a person or thing or of a proposed structure…’ Of course you are familiar with catwalk models, mannequins, and scale models of, say, a new building or Thunderbird 2 (the best Thunderbird IMHO). But I prefer a broader definition, so here’s my own: a model is a representation or a simulation of one or more aspects of the desired object or process. Firstly, a model is only a representation or an ‘abstraction’ of the real thing. 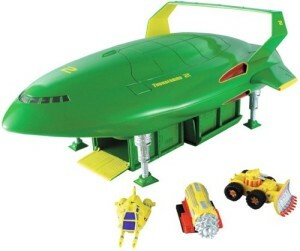 If for example, you built a full size working Thunderbird 2 that would be a prototype or a ‘proof of concept’. In IT projects different models are created at different times, and they normally focus on one or a limited number of characteristics (aka views/perspectives/dimensions) of the thing of interest. Data (or Entity, Class or Object) – all similar ways of representing the properties of things. Need to know more, have a look at the Data 101 primer. Process (or activity or sequence) – the sequence of tasks and events that happen or need to happen. Business – what an organisation does, why, where, how and by whom. 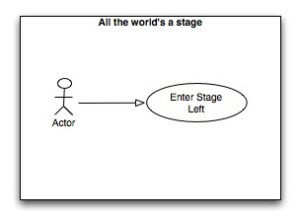 Use Case – here is an example of an Actor (stick person from an earlier post) interacting with a system, represented by the oval, in a domain of interest, the box. It may look simplistic, but it does offer a powerful technique used by Business Analysts and others to understand what is happening now ‘as is’ or what the future could look like ‘to be’. Requirements, conceptual, business rules, state, financial, decision, component, wireframe (web page layout), information, deployment, computer model (simulating some real life behaviour), mathematical/statistical etc. This is not an exhaustive list. In fact there is probably no limit to the characteristics that could be modelled. Tell me again, why are models important? It’s not so much the model that is important per se, but the process of modelling, i.e. knowing enough about the thing of interest to create a model, and then using it to analyse, test, and otherwise ‘kick the tyres’. It’s normally more efficient, cheaper and quicker to produce a model of something before committing to design and build the real thing. Because the model is not the ‘thing’, be careful that you don’t believe everything that a model may be telling you, or that you are inferring. With the addition of people and the real world, systems sometimes exhibit unexpected ‘emergent’ behaviour! I hope you found this useful. Let me know if you want more information or other topics that you would like to read about in the IT elementary school. Perhaps you could give some more real world examples of the concepts?